Michael Lewis, Some Will Take More Prodding, Others Will Be More Difficult, 2008. Oil on canvas. Image courtesy of the artist. © Michael Lewis. 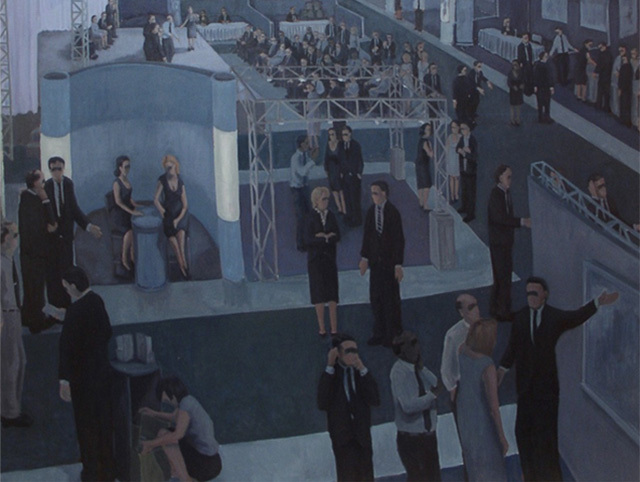 In this painting, which is part of a larger series entitled I’ll Take Care of It, Lewis illustrates a conference-style, office gathering of people conversing and interacting with each other, depicted through the high perspective of a surveillance camera. This work highlights the tracking and surveying of the bodies who undertake the mundane tasks of everyday corporate life, but blacks out—censors—the eyes, thereby masking recognizable identities and individuality. A component of the Art and Surveillance Project, this online database catalogues artists, artworks, and exhibitions addressing surveillance within Canada post-9/11. Organized as an on-going directory, this project welcomes any updates and suggestions. Jennifer Marman and Daniel Borins, Google, 2010. Installation. Image courtesy of the artists. © Marman and Borins. 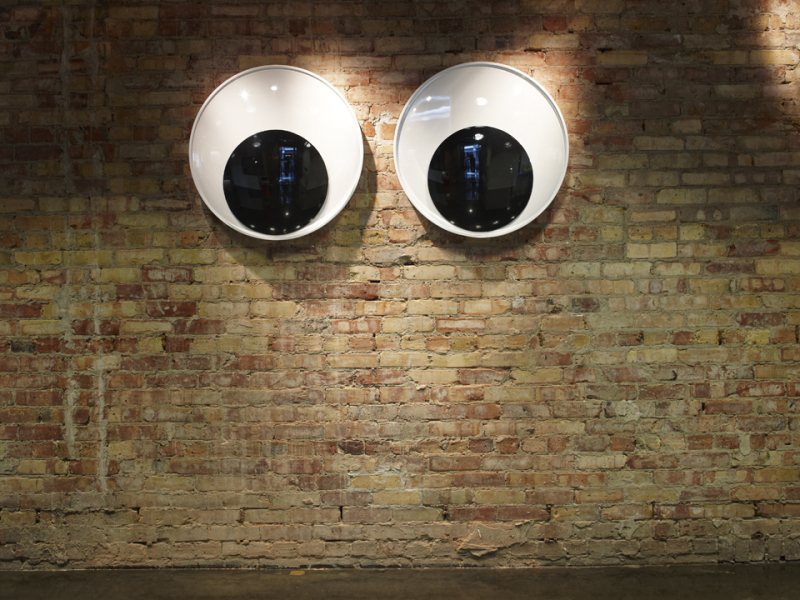 Commissioned by the Martin Prosperity Institute in Toronto, Google is a sculptural installation composed of two large “googly” eyes mounted on a wall. Hidden cameras inside the sculpture watch, track, and record people as they pass by, adding a potentially sinister element to the humour offered by the googly-eye form. The title of the piece, Google, acknowledges the ways in which the search engines watch and record user data for ambiguous reasons. With this work, Marman and Borins combine humour and surveillance technologies to highlight how personal surveillance and data collection by governments and corporations occur in our physical and virtual everyday lives, and to question whether we should trust them. Marika Dermineur and Stéphane Degoutin, Google House, 2003-ongoing. Interactive online installation. Image courtesy of the artists. © Marika Dermineur and Stéphane Degoutin. Database works: Marika Dermineur and Stéphane Degoutin, Google House, 2003-ongoing. Interactive online installation. Born in Toronto, Degoutin is an artist, writer, and researcher currently based in Paris where he teaches at École des Arts Décoratif (ENSAD). With collaborator Gwenola Wagon, he has created a number of online works, including Terrorism Museum in an Airport (2009-2013, http://www.nogovoyages.com/terrorism_museum.html), and Dance Party in Iraq (2012-2013, http://www.nogovoyages.com/dpi.html). He is also the author of the book Prisonniers volontaires du rêve américain (Voluntary Prisoners of the American Dream), Editions de la Villette, Paris, 2006. Cover of exhibition catalogue, 2010. Mounted as a partnered project between the Art Centre and The New Transparency: Surveillance and Social Sorting at Queen’s University. | Agnes Etherington Art Centre, Kingston, ON. Sorting Daemons was mounted at the Agnes Etherington Art Centre at Queen's University (Kingston) from 16 January to 18 April 2010. From the exhibition’s publicity release: “Information-gathering systems increasingly affect our lives, tracking our movement and consumer preferences. Such “sorting daemons” reinforce existing streams of influence and quietly create new ones. The artists in this exhibition take measure of our relationship to surveillance by addressing its social, political and aesthetic dimensions.” This exhibition was developed in partnership with The New Transparency and opened in conjunction with "Camera Surveillance in Canada: A Research Workshop" at Queen's University, Kingston that took place 14-16 January 2010. Brenda Goldstein, Panopticon, 2003, DVD. 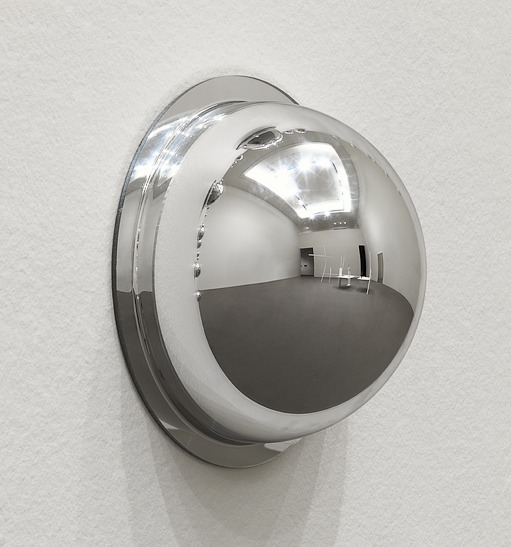 Antonia Hirsch, The Invisible Hand (after Adam Smith), 2009, surveillance mirrors. 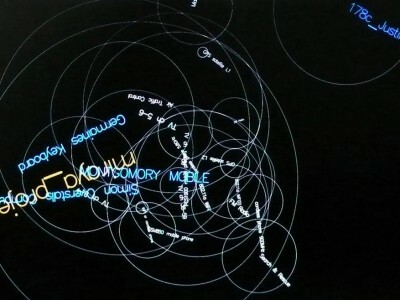 Dave Kemp, Data Collection, 2009, photographic installation. Tran T. Kim-Trang, Ocularis: Eye Surrogates, 1997, DVD. Germaine Koh and Ian Verchere, Broken Arrow, version 2, 2009, electronics and custom software. Arnold Koroshegyi, Rupture, 2008, 6-minuted looped video installation. Ruthann Lee, Trying to Concentrate, 2004, DVD. Michael Lewis, Some will take more prodding. Others will be more difficult, 2008, oil on canvas. Jill Magid, Evidence Locker: Trust, 2004, DVD and book. Walid Ra’ad, Part 3: Miraculous Beginnings, The Dead Weight of a Quarrel Hangs, 1999, DVD. Kathleen Ritter, Hidden Camera, 2006, Pigment print. 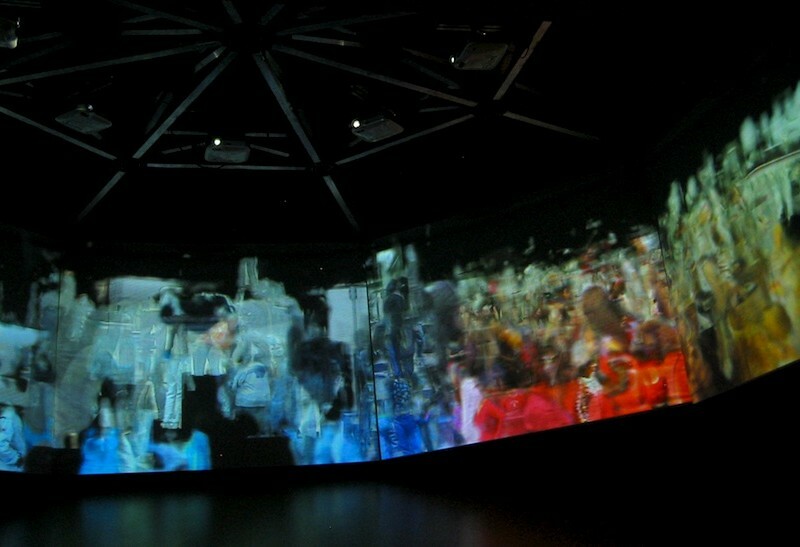 David Rokeby, Sorting Daemon, 2003, computer, LCD screen, camera, and projection. Tom Sherman, SUB/EXTROS (1), SUB/EXTROS (2), SUB/EXTROS (3), 2001, DVD. Cheryl Sourkes, Cam Cities, Virtual Toronto, 2001, inkjet on unstretched exterior vinyl banner, steel bar. John Watt, Scannex Man, 1981, DVD. Germain Koh and Ian Verchere, Broken Arrow, 2009. Electronics and custom software. Image courtesy of the artists. © Germaine Koh and Ian Verchere. Created by Germaine Koh in collaboration with Ian Verchere, Broken Arrow uses sensing hardwares to track and trace blue-tooth technologies within a particular radius of the piece. The artwork captures the signals and electronic communication found in wireless devices such as Bluetooth, Wi-Fi, cellular phones, radio, and GPS, each registered signal marked by an auditory signal and a visual design. In this way, Broken Arrow makes visible these often invisible technologies and their signals. Koh’s installation reveals the often unseen ways information transmitted and shared via social devices, and reminds its viewers about the risks associated with social networks and privacy. David Rokeby, Gathering, 2004. Video installation. Image courtesy of the artist. © David Rokeby. Video installation | Commissioned by the Art Gallery of Hamilton. Hamilton, ON for the Sao Paolo Bienal. Commissioned by the Art Gallery of Hamilton, Gathering captures images of people outside the gallery space. A software programme detaches each person from background, then organizes particular aspects (heads, t-shirts, jeans, coats, hands) by colour. The elements are recontextualized following one of an available three sets of rules that determines how the images are put back together. 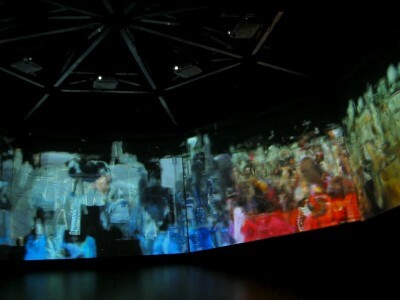 Inside the gallery space, the resulting composite images are displayed on a circle of 8 video projections. 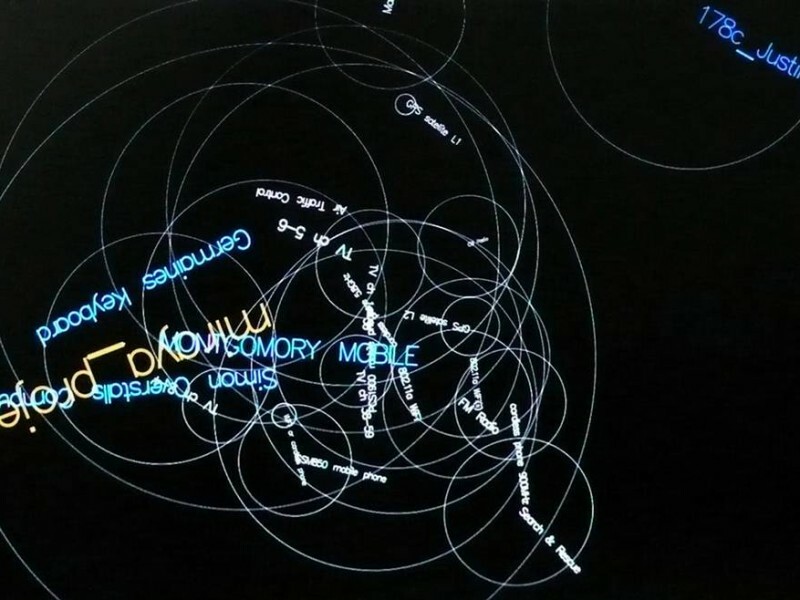 Similar to his piece Sorting Daemon (2003), Gathering questions the somewhat arbitrary nature that dictates the ways in which automated systems survey, record, and organize information. David Rokeby, Machine for Taking Time, 2001. Video projection, stored digital images, custom software. Image courtesy the artist. © David Rokeby. 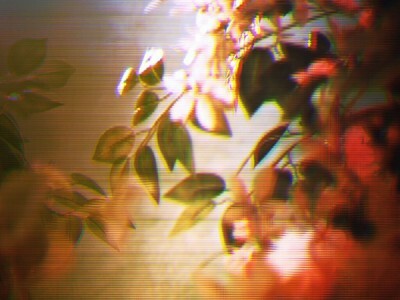 Video projection, stored digital images, custom software | In multiple exhibitions, including “Early Delights/Deep Gardening,” curated by Su Ditta, Oakville Galleries, Oakville, ON. Machine for Taking Time was commissioned by the Oakville Galleries for the show “Earthly Delights/Deep Gardening.” In the piece, Rokeby’s “machine” consists of a surveillance camera that takes 1081 still images of the gallery’s gardens along the same path daily. All of these images are archived, then stitched back together as a video that retains that same path, but uses images from different days. 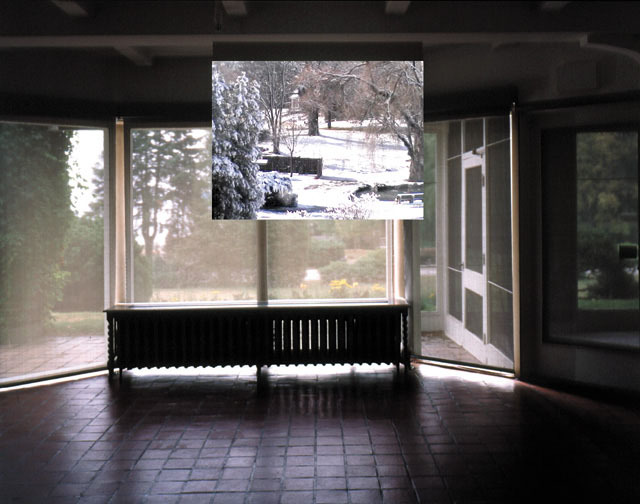 In the gallery, the video of the surveillance images is mounted next to a window overlooking the gardens, which juxtaposes the virtual and lived spaces. As its title suggests, this artwork highlights time not simply as an unfolding of chronological events or images, but rather, as a reconstruction of moments, memories, and illusions. This piece is a site-specific work that Rokeby recreated in several different locations. He also developed a newer incarnation of the piece, David Rokeby, Machine for Taking Time (Boul. Saint-Laurent) (2006-2007), commissioned by Daniel Langlois Foundation. More information on this latter piece can be found on the foundation’s website, http://www.fondation-langlois.org/e-art/e/machine-for-taking-time.html. Kathleen Ritter, Hidden Camera, 2008. Pigment inkjet print. 122 x 91. 5 cm. Image courtesy of the artist. © Kathleen Ritter. 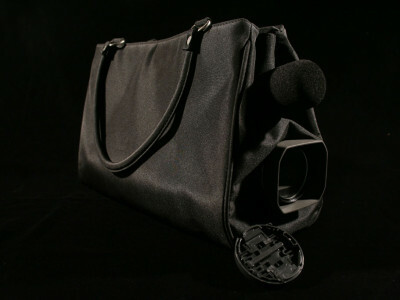 This project offers a photograph of a hidden camera device and microphone used by Ritter to record a number of her performance pieces that documented different public sites, including grocery stores and airports. 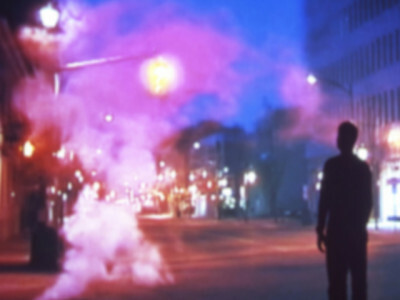 In this way, Ritter questions the complex power structures inherent to the politics of seeing/seen and visibility/invisibility in public spheres. Mounted as a partnered project between InterAccess Electronic Media Arts Centre, and the international workshop The New Transparency: Surveillance & Social Sorting at the University of Toronto. 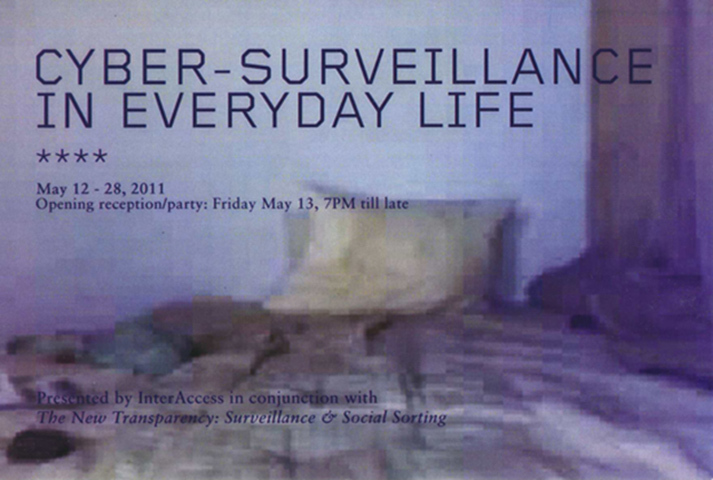 | InterAccess Gallery, Toronto, ON. David Bouchard, Bruno Lessard, and Pierre Tremblay, Meta Incognita – variations estivales, time-lapse video and soundtrack. Derek Dunlop, A Lover’s Geography, photographs. Kristen Atkins, Portrayal Portal, installation with laptop and data projection. 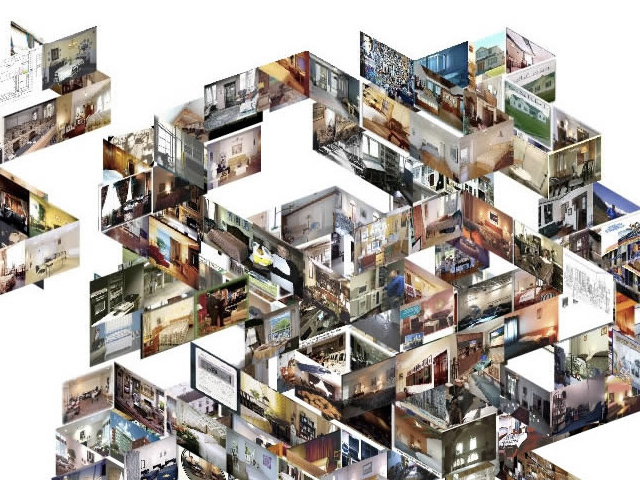 Jon Rafman, The Nine Eyes of Google Street View, screen captures of Google Street View. Tomer Diamant and Mathew Hannam, Comment/Like – Code of Quick Response, installation. Arnold Koroshegyi, Rupture, 2009. Installation photograph of the piece in the group exhibition “Sorting Daemons: Art, Surveillance Regimes and Social Control,” Agnes Etherington Art Centre, Kingston, ON. Image courtesy of the artist. © Arnold Koroshegyi. Database works: Arnold Koroshegyi, Rupture, 2009. 6-minute looped DVD video. 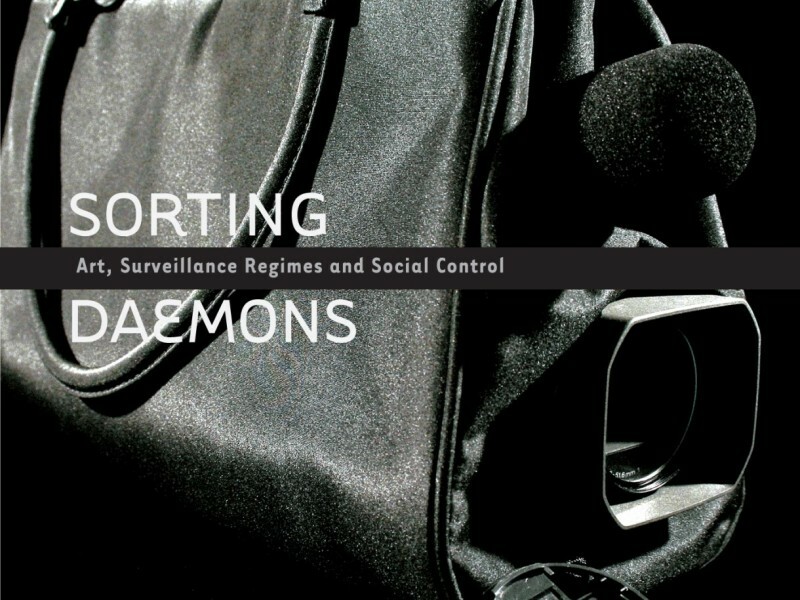 In the group exhibition “Sorting Daemons: Art, Surveillance Regimes and Social Control,” Agnes Etherington Art Centre, Kingston, ON. Koroshegyi addresses the shifting concepts of place within geopolitical landscapes through his works in a variety of art media, including photography, installation, and intermedia. Based in Toronto, Koroshegyi teaches studio practices and art history at Sheridan College Institute of Technology and Advanced Learning, and the University of Toronto, Mississauga. His art has been exhibited throughout North America. Antonia Hirsch, the invisible hand (after Adam Smith), 2009. 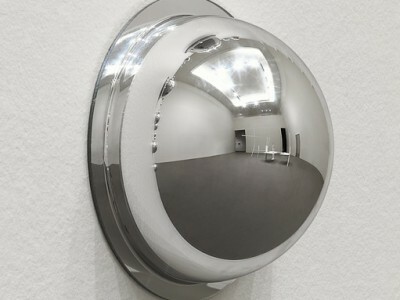 Detail, 360-degree surveillance mirrors, fasteners. W 1047cm x H 511cm x D 11.5cm. Photograph by Rachel Topham, Vancouver Art Gallery. Image courtesy of the artist. © Antonia Hirsch. Database works: Hirsch, Antonia, 2008. Double Blind. Installation, mirrored acrylic domes. W 4.5m x H13.7m x D .5m. // Hirsch, Antonia, 2009. The Invisible Hand (after Adam Smith). 360-degree surveillance mirrors, fasteners. W 1047cm x H 511cm x D 11.5cm. Hirsch is a Berlin-based writer, artist, and editor, who has exhibited and published her work widely throughout North America and Europe. Database works: Kathleen Ritter, Interloper, 2005. 4-channel video installation with sound, 100 performance scripts, photographs, map, map pins, cork board // Kathleen Ritter, Hidden Camera, 2008. Pigment inkjet print. 122 x 91. 5 cm. 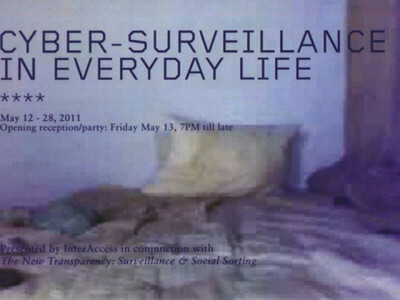 In multiple exhibitions, including “Wide Open” at the Robert McLaughlin Gallery, Hamilton, ON, 2008, and “Sorting Daemons: Art, Surveillance Regimes and Social Control,” Agnes Etherington Art Centre, Kingston, ON, 2009. Ritter is an artist and curator based in Vancouver and Paris. Her art practice often addresses the broad intersections of visibility with systems of power and technology. From 2007 to 2012, Ritter was Associate Curator at the Vancouver Art Gallery where she organized a number of exhibitions, including How Soon Is Now; Beat Nation: Art, Hip Hop and Aboriginal Culture (with Tania Willard); and Rebecca Belmore: Rising to the Occasion (with Daina Augaitis). Melanie Lowe, You Saw Me?, 2008. New media database projection. Image courtesy of the artist. © Melanie Lowe. Database works: Melanie Lowe, You Saw Me?, 2008. New media database projection. 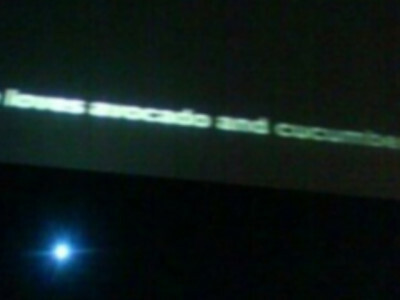 In the exhibition, “Cake on the Icing,” curated by Shaun Dacey, Interaccess Electronic Media Arts Centre, Toronto. Originally from Halifax, Lowe is a video and digital artist currently based in Toronto. Lowe earned a Bachelor of Design in Communication Design from NSCAD University, and a Master of Arts in Visual Art from York University. In her work, Lowe often questions the everyday actions and interactions between the self and others in contemporary life. Our laws and police powers need to be strengthened in the area of surveillance, detention and arrest. They need to be much strengthened. I assure members that work which is already under way will be expedited.